Georgette Heyer had the fortunate knack of selecting catchy titles for her novels that were a perfect match to what would unfold inside: The Convenient Marriage, The Unknown Ajax, Bath Tangle, Devil’s Cub, Sprig Muslin, The Nonesuch, and on and on. Each title is short, evocative and intriguing. False Colours is a perfect example. Anyone with a modicum of military knowledge will recognize the term ‘flying false colors’ or flying a flag of a country other than one’s own to deceive the enemy into believing that a ship or fort or field banner is of a friend or allies until they are trapped. That is exactly what transpires in Heyer’s Regency-era novel False Colours. The Honorable Christopher “Kit” Fancot is pressed into operating under a false flag by impersonating his identical twin brother Evelyn, Lord Denville, who has inconveniently disappeared at a critical moment in the Fancot families lives. Two years after the close of the Napoleonic Wars, Kit returns to England from diplomatic service in Vienna to meet his widowed mother Lady Denville distraught over the disappearance of his older brother Evelyn on the eve of an important introduction to his future bride and her family. Because of his mother’s mounting debts Evelyn must make a quick alliance so he will have access to his family trust. Their future depends upon Evelyn marrying the Honorable Miss Cressida Stavely, an heiress whose formidable grandmother the Dowager Lady Stavely must approve the marriage or the betrothal is off. Lady Denville begs Kit to impersonate his brother for just one evening to win time to locate his wayward brother. He agrees and the masquerade begins. When Lady Denville invites Evelyn’s fiancé and her family to their country estate for a small gathering the hoax must continue. Kit soon discovers that Evelyn’s alliance with Miss Stavley is a marriage of convenience for both of them. His trust will be available to him upon his marriage and she will be free of her imposing step-mother. As Kit and Cressy are thrown together they are attracted to each other. By careful deduction and a few blunders by others, Cressy is able to discover that Kit is impersonating his brother. But, she has fallen in love with him of course and keeps his secret. When the prodigal son finally resurfaces with a wild story of where he has been and news of finding true love, the two brothers must either face the scandal of their deception, or depend upon their mother to devise an alternate solution that suits them both. Originally published in 1963, False Colours has its charms and foibles. Heyer is in true form excelling at historical detail, but the plot, though surrounded by memorable characters finely drawn, was predictable and so formulaic that I was wracking my brain trying to remember other famous brother or look-a-like swapping stories: The Prince and Pauper, The Master of Ballantrae, and a vague recollection of Shakespeare using this device too. Because Kit holds back his feelings for Cressy, the romance really takes a back burner until the very end. The most dominate relationship in the book, which took up a chunk of dialogue, was between Kit and his mother. He was noble and admirable. She on the other hand was vapid, silly and careless. Happily, in true Heyer fashion, the two most sensible characters do end up together. But that was telescoped from the beginning. It was just a joy to watch her craft in getting us there. On a whim, Laurel Ann Nattress created Austenprose, a blog celebrating the brilliance of Jane Austen’s writing and the many offshoots that she has inspired. As a bookseller at Barnes & Noble she delights in selling her favorite author’s works to the masses and in her spare time, she is currently deep into her editing duties for a Jane Austen short story anthology to be published in 2011 by Random House. An expatriate of southern California she lives in a country cottage near Seattle, where it rains a lot. You can follow Laurel Ann on Twitter as Austenprose. Enter a chance to win one copy of False Colours, by Georgette Heyer (Sourcebooks, 2008) by leaving a comment stating what intrigues you about the plot or characters, or if you have read it, which is your favorite character or scene by midnight Pacific time, Monday, September 6th, 2010. Winners will be announced on Tuesday, September 7th, 2010. Shipment to continental US and Canadian addresses only. Good luck! We have arrived to what I consider one of my very personal favourites, because it has never ranked among the top among other Heyerites, it usually considered average. One of the reasons why I love it is Kit. He belongs to the type II heroes, but unlike most heroes of both types, he is a second son, so he has to earn his own living and the career chosen for him is in the diplomatic service (a path many, many, many years I ago I dreamed to follow), which suits him very well as we can witness how he manages to disentangle the imbroglio. Most humbly, he could hardly admit what is evident to most of the characters around him, that he is infinitely better than his twin, and yet there is a strong bond between them. Cressy is also a great heroine, one who manages to keep her head in critical situations, so they are very well matched. For example, one of my favourite episodes is when she manages to rescue Kit from a blackmailing attempt at the hands of the mother of one of Evelyn’s former ‘prime-article’. And like them, one wondered who was that woman’s ex-protector. The Dowager Lady Stavely is another of the great matrons in Heyerdom, but I believe Sir Bonamy Ripple deserves too an honourable mention as a comic character, a true example of fidelity to his first-love and thus a true knight, I mean, baronet in shining armour ;-). I think this novel can be a very good introduction for beginners. Nice review Laurel Ann! – I recall it taking me more time to get into this Heyer, but like you, the characterizations saved the day, with Kit and his relationship to his mother [the ultimate ditz] and the very close tie to his twin [despite their differences in personality] is what in the end endeared me to the book – and again, a couple who are made for each other and how they work through society’s and family duties to be together. And yes, Cinthia – Sir Ripple is one of Heyer’s best drawn creations and rightly deserves your honorable mention, and then some! I, too, liked Kit’s relationship with his mother, and with his twin. Great review, Laurel Ann, I have also been impressed with GH’s pithy, descriptive titles. It’s always a pleasure to read her writing. This one has always been one of my favorites! Kit & Cressy make a charming couple. And I’m absolutely in love with Lady Denville while recognizing that she must be at the same time so frustrating to live with… So many great scenes – the way that Lady Denville rids the house of unwanted guests is delightful. I can definitely appreciate Cressy’s “bubble of laughter” when she’s around the Fancots. I only read False Colours for the first time last October but I was immediately a fan. I really am quite fond of the more male-centric novels that focus less on the romance and more on mystery or adventure (though there must still be romance, of course). Kit is a wonderfully competant hero and I love him all the more for his affection for his flighty mama. And Sir Ripple…too magnificent for words. I’m wondering whether she told him if she knew his secret or not. I’ll have to read this one! This is another of the books on my top-five (or so) Heyers (I think there are 15). I love Kit and Cressy; also Kit’s mother. I have long thought that Mrs. Bennet ought to be portrayed like Lady Stavely – extremely pretty, and a total ditz. Imagine Mrs. Bennet if she had had sons to adore and spoil her (like Kit and Evelyn), rather than daughters to treat her with disdane. Sir Bonamy is another delightful character – alive on every suit (as GH would say), in spite of the Fancot twins’ opinion that he is a dolt. Lady Stavely’s extremely expensive attempts at economizing are worth the price of admission. . . I agree, Cinthia, the scene between Cressy and the blackmailing mama is perfect. oops – meant Lady Denville! Does anyone else remember any classic stories where brothers or look-a-likes swapping places is used as a plot device? My brain was in a haze when I wrote the review in the wee hours last night. Identity swaps as plot devices in literature? Hmmm… there’s Shakespeare’s Twelfth Night (although that’s a twin brother and sister-dressed-as-a-boy mishap), The Return of Martin Guerre and The Count of Monte Cristo (not exactly swaps, but more the questioning of ‘false’ identity), Gattaca, Mozart’s Così fan tutte. I’m sure there’s a lot more that escapes me now. No, I forgot about The Man in the Iron Mask! But that’s the perfect one! The story is based on the conjecture that Louis XIV had a twin brother (the man in the iron mask) who secretly replaced the original king and became the compassionate Sun King. I just remembered the Prisoner of Zenda as another look-a-like swapping story. There is also A Tale of Two Cities, where there are two look-alikes, not actual brothers, who get swapped . . . There are two or three sets of twins causing confusion in A Comedy of Errors; then of course there is The Parent Trap. I’m sure others can come up with better examples. LOL AprilFool! I did think of the Parent Trap — but I thought you guys would laugh at me. It is a bit of stretch for a literary reference! ;-) There is also a Bette Davis movie with twin sisters where the bad sister kills the good sister and impersonates her. Can’t remember the title, but I am sure some will. This is also one of my top favorites. Love Kit and Cressy, but the major reason I love this book is because I also have a bubble of laughter while reading it. Sir Bonomy talking to Kit after being given his fate. I won’t say more because there are others who haven’t read it and I don’t want to be a spoiler. I laughed out loud at this scene! I love Kit and Cressy. Count me among Kit’s adoring fans. He is so quietly competent, and loyal to the family even though the masquerade causes him terrible qualms. I don’t mind his mother although she would make me crazy immediately in real life. My favourite scene is the one where Sir Bonamy Ripple gets his heart’s desire. The look on his face when he realizes!!!! I enjoyed this one also, the problems that develop due to the identity switch, and like other commenters I loved the secondary character of Sir Bonomy and his role in the story. It’s been a long time since I read False Colours, and I really need to re-read it again. I remember it was an OK read for me, but not a favourite. and I remember too being exasperated by the ditzy mom. Another twin swapping story is Judith Michael’s Desperate – where twin sisters exchange lives for what was meant to be a short period of time, but then one twin breaks her arm, and falls in love with the husband of the other twin, etc – this was an 80’s book, I think, and wasn’t it made into a TV movie or something? Look-alike identity-switching twins! How very soap opera-like of Georgette. Or maybe the soaps lifted the idea from classic authors like her. I haven’t read any of her work yet, but as has been mentioned in messages with each other, I certainly mean to! of course, I have to love Lady Denville! and what a great hero Kit is! a bit like Freddy, but of course his brother isn’t as atrocious as Jack! You’ve inspired me to re-read this! Another one I haven’t read yet. So many to catch up on and so little time! Thanks for another great review. 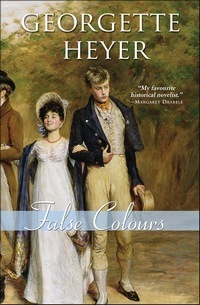 False Colours is my #1 Heyer so far, partly because I like Kit’s character very well – no title to live off for him, so he is not the typical cynical, worldly and jaded hero. As a second son he earns his keep with a diplomatic carrer. And I love his complex relationship with his mother – loving yet very aware of her excesses. I loved Cressy too for recognizing Kit thru this impersonation, very smart deduction. And she has no airs or vapours for being an heiress. I loved Sir Bonhamy Ripple who loved his food well enough to have two cooks but smart enough to figure out what was happening with Lady Danville and Kit at their country house. I haven’t read this one yet. It sounds interesting. Sometimes I don’t mind formulaic if the formula works. I always wanted to see this one as a movie. This is another one that’s just so visual! Sir Bonamy is just awesome, and I love Lady Denville. She’s a ditz, yes, but she loves her sons more than life! I also like the verbal sparring here-like Lady Stavely. I’d never heard the term nickninny, but it so descriptive, that I’ve adopted the use of it, among other words. I love Heyer’s title choices too! This looks like a fun story despite the predictability. Looking forward to it! Great review! This plot sounds intriguing although familiar with the brother impersonation. It seems like Heyer often gets her readers intrigued with the machinists of how they are going to get to the inevitable ending. Thanks for the review! I am intrigued by the twins in the novel and the suitable use of impersonation and the consequences. There are SEVERAL Shakespeare plays with this kind of plot, although for some reason not all of the titles are coming to me right now. In fact, the first thing I thought when I read the plot synopsis was, “That sounds so Shakespearean!” Glad we’re all on the same wavelength there. Don’t forget Heyer’s great characterisation through names. Albinia Gillyfoot, wasn’t that the name of Cressy’s stepmother? I liked Lady Denville and while this is not my favorite Heyer, it’s always a good and fun read. I loved this book because Kit is such a great hero and brother! I have this checked out on CD right now, though I haven’t gotten to start it yet. I checked it out before the review was even posted, because the set-up with the missing elder brother and the younger who steps into his place sounded… well, it sounded like fun. It also provided a bit of a mystery and I like my Regencies to have a mystery as well. This might have been the first Heyer I read. I like Kit-I come from an Army family. I think Lady Denville is such a fun ditz. Drives you crazy-but has everyone’s best interest at heart. Okay, I admit I am pulled to this one because of one twin impersonating the other. Yes, the substitution plot has been done before but one plot device I have not read in quite awhile. And though Laurel Ann’s wonderful review says this is rather formulaic for Heyer, since I haven’t read Heyer yet that won’t be an issue. For me this looks refreshing and fun.